Hotel Hampton Inn Manhattan-Seaport-Financial District, New York, United States of America - Lowest Rate Guaranteed! Located in New York (Financial District), Hampton Inn Manhattan-Seaport-Financial District is within a 15-minute walk of National September 11 Memorial and Wall Street. 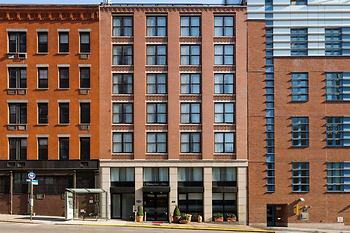 This hotel is 0.7 mi (1.1 km) from New York Stock Exchange and 0.8 mi (1.3 km) from Brooklyn Bridge. The staff was super friendly and went out of their way to meet your needs. The location was perfect for my needs in visiting a student of Pace University. Everything is a short walk away. I was located at the end of the hallway and the bathroom was freezing cold. I tried to prop the door open so the heat from room could get in there. It helped a little bit but not a lot. I stayed for 3 nights and my room key was demagnetized every night. I never heard of that and it was completely ridiculous. With one elevator waiting to go back down. When the person at the desk made the statement only keep keys operable for one night at a time. What? I am a frequent traveler and I have never heard of that. We were travelling with another couple who had never been to NY and had in mind a few things to do. The location allowed us to do everything on our list with ease. The staff at the Hotel were absolutely wonderful. The rooms were small but clean and comfortable. We all would definitely stay here again. As we were on our way to France we had a late afternoon flight and they allowed us to leave our luggage while we took a city tour. We later returned to pick up our luggage and they loaded it right into our Limo for us. Hotel was close to many restaurants, Little Italy and Chinatown. The whole experience from check-in to departure.